We’d love your help. Let us know what’s wrong with this preview of Saving Jesus from the Church by Robin R. Meyers. To ask other readers questions about Saving Jesus from the Church, please sign up. I'm curious but shy in picking this up since I am now an atheist. As a Christian this would have highly appealed to me. I even wrote my own book about my life "Christians Are Revolting: An Infidel's Progress" with the intent to promote a truer Christianity. I even used a one-liner on my cover similar to this title here. So does this book discredit the Bible as "God's Infallible Word?" And does it discredit sacrifice? But at the same time: I think every Christian should be forced to read this. It's good to know what the enemy is up to. And especially how gullible most modern church goers really are. (hint: look at the Goodreads reviews - some are probably even Bible owning church dwellers). I've read lots of crazy books with heretical thoughts but I think this one wins. The saddest things is that so many book reviewers actually accept this scholarship as trustworthy. How pathetic. (they probably all consider Dan Brown's The Davinci Code to be a work of historical science.) Yes, the world has much comedy to answer for. Are you all unaware that there have been many great Bible scholars throughout history who deserve to be appreciated and considered before These Jesus Seminar TURDS? NO? I didn't think so. Satan has been very busy - be sure to check both sides of the story - lies are often very smooth and well presented. The first thing I like doing with books like this is seeing who APPROVES of its contents; that's where the funny begins. This one of course is high-five'd by Archbishop Desmond Tutu, Bill Moyers, John Shelby Spong and a few other comical wanna-be Bible scholars. Meyers quotes from every non-Christian (but desperate to be?) heretical scholarly source he can find. From John Dominic Crossan to Elaine Pagels to Bart Ehrman. These are scholarly names every Biblical Christian (and honest student) laughs at. Roughly equivalent to the Mad Magazine scholarship of liberal Christian know-it-alls. According to my Bible (which I love and trust fully) I indeed want to be cut off from generous and compassionate gnostics. The Bible says we should not even allow them in our houses. …9Anyone who goes too far and does not abide in the teaching of Christ, does not have God; the one who abides in the teaching, he has both the Father and the Son. 10If anyone comes to you and does not bring this teaching, do not receive him into your house, and do not give him a greeting; 11for the one who gives him a greeting participates in his evil deeds. Now don't trust me. Read your time tested and approved Word of God (we call it the Bible) and compare Robin R. Meyers babblings to that of God's Word. Choose who you will serve. Most people will probably prefer Mr. Meyers itching ear crap. Such is life. I could quote 100's of passages from Meyer's poison. But does anyone really care? Most people have chosen before they even opened the book. My final comment: If Jesus did NOT die for your sins - then you still got a HELL-OF-A-LOT of sins to work with. Satan will be proud of your efforts. "But this is a book meant not to do further harm to the church-rather to help reconstitute it." This is a fantastic book - always thoughtful, inclusive and well-intentioned, as well as challenging and heretical at times. In short, Rev. Robin Meyers has a unique view of Christian spirituality and communicates this in a fascinating, maddening, uplifiting and compelling way. Ostensibly, Rev. Meyers is a (very?) liberal Protestant. Yet, given his view of the need for Christians to return to the original practice of the faith, he might also be considered a conservative (or purist) of sorts. Esse This is a fantastic book - always thoughtful, inclusive and well-intentioned, as well as challenging and heretical at times. In short, Rev. Robin Meyers has a unique view of Christian spirituality and communicates this in a fascinating, maddening, uplifiting and compelling way. Ostensibly, Rev. Meyers is a (very?) liberal Protestant. Yet, given his view of the need for Christians to return to the original practice of the faith, he might also be considered a conservative (or purist) of sorts. Essentially, the author's primary theme is that there is a difference between being a follower of Jesus and being a Christian. The latter subscribe to "transactional" faith proffered by the modern church, espousing a set of (quasi-)theological propositions/"beliefs" in this world in exchange for (eternal) benefits in the next. By contrast, 'true' followers of Jesus understand His teachings and emulate His example, mindful that "a Jewish man whose brief and tragic life was a metaparable and living proof that St. Irenaeus was right when he said, 'The Glory of God is a human being fully alive.'" He continues on this theme to take the institutional church to task for what he perceives to be a separation of Jesus, "an itinerant Galilean sage," from Christ, the divine savior. Essentially, he argues that in making Christ fully divine - a concept that was not originally associated with Jesus but was added to his developing legacy as the Gospels were written - the church has separated Him from us. Since he's perfect, of/from God, we can believe in him, but we cannot be like him and so end up espousing a (largely church-created) faith in His name but not following his example. By contrast, Rev. Meyers urges that "Christians" revert to being followers of Jesus along the lines of the original disciples and adherents who formed an inclusive, beloved and non-hierarchical community dedicated to emulating Jesus's example, even, potentially, to death. He also warns against the reality that, in contrast to the Jesus movement of antiquity, the modern church is more often associated with the powers that be and with preserving the status quo that serves the latter's interests. He urges that the church return to its subversive roots, reminding readers that Jesus was actually crucified because he was a threat to the established order of his time, not a protector of it. As he notes, "As for seeking power, Christianity is a faith that was born at the margins of society, and it has always been most effective when it speaks from the margins." He goes on to examine the scriptures and how a number of the tenets of modern Christianity were developed (largely to serve the temporal interests of the developing church) but are not authentic aspects of the wisdom of Jesus. He parses concepts like the Blood Atonement, the physical Resurrection and the divinity of Jesus and helps us to understand that, following their theological/allegorical meaning, they can be reinterpreted in a way that strengthens faith rather than forces true believers to suspend disbelief or skeptics into atheism because they can't make the leaps of illogic. He further chides the church for a lack of honesty that it uses to engender a manipulative fear amongst its members. As Rev. Meyers points out, none of us really knows what happens when we die, so the church owes it to its members to be honest about this and to stop selling its transactional version of faith, which the author describes as "an intellectual assent to propositional statements," reducing its members to "a fearful and ignorant people looking for favors in exchange for beliefs." As he differentiates spirituality from (institutional) religion, Rev. Meyers offers a compelling and contrasting vision. He espouses the return to the roots of the Jesus Movement when its adherents strove to emulate the earthly example of their departed and yet spiritually resurrected leader. In so doing, we can access "the grace that brings radical freedom and the end of striving. Faith is something we do, against the odds, in loving defiance to a world gone mad. We do not become a good person by believing in God; we become a good person by loving God, especially the God we meet in every living thing." And thereby we can experience the timeless and eternal in this world (and maybe the next as well). Accordingly, his vision is for a new/renewed church, modeled after the early faith (and before it became an institution). "In the emerging church, faith will not be a transaction (benefits for beliefs) but a beloved community in which the rewards of I-Thou relationships are intrinsic. Love will be its own reward, and the church will stand by its most sacred duty - to slay the self in service to Something More.... latter day disciples will have an opportunity to be resurrected in this world, rather than the next." I feel rather conflcted about this book, largely because I was ready to throw it out the bedroom window when I first started and was prepared to mostly agree with the last half of it. Robin Meyers attempts to 'save' the human Jesus from the distortions (he feels) which create the divine Christ in the imaginations of many of his (evangelical) supporters. This latest entry in the religious culture wars, even while disavowing those wars, really represents an extended polemic against the excesses of I feel rather conflcted about this book, largely because I was ready to throw it out the bedroom window when I first started and was prepared to mostly agree with the last half of it. Robin Meyers attempts to 'save' the human Jesus from the distortions (he feels) which create the divine Christ in the imaginations of many of his (evangelical) supporters. This latest entry in the religious culture wars, even while disavowing those wars, really represents an extended polemic against the excesses of traditional Christianity, especially in its evangelical form. The result is a large amount of doctrinal bath water being thrown out for no particularly good reason. Much of the bathwater being thrown out occurs because Meyers cannot conceive of anyone who might actually find value in such things as the Incarnation, the Trinity or, indeed, even any atonement theory who also may believe in social justice, environmental issues and community. The result is a set of binary oppositions which not only are not necessary, but also distort what many Christians continue to believe. The harping upon the critical superiority of the exegesis of the Jesus Seminar does little for me as well, so that hardly helps my mood. Yet, as soon as one gets past the doctrinal issues and into the area of practice, Meyers isn't far from being right. His condemnation of the prosperity gospel is particularly good and his suspicion of American patriotism in the expression of American Christianity is also well taken. Incredible. A must read for all Christians and agnostics/atheists who have always found Jesus the man more incredible than Christ the "son of man." Robin Meyers has put into words what I have been struggling to articulate since childhood. Thank You! Unfortunately, another "Remove God from Jesus and all will be well" book (too bad it isn't biblical). Too bad; I'd hoped for much better. Excellent in so many ways... worth a re-read just to take it all in. Definitely a must-read for liberal Christians who are up for the challenge as told in the title: to stop worshiping Christ the "son of God", and start following Jesus the teacher. Another reviewer said it best... "mixed feelings". I appreciate and believe in the overall core message of this book. The institutional church, if it is to speak to an emerging generation, needs to emphasize more the act of following Jesus, i.e., feeding the poor, clothing the hungry, healing the sick (and not just physically), reaching out to the outcast, rather than focus on the worship of Christ. That being said, there are very serious errors in this book that led me to take it with a grain of Another reviewer said it best... "mixed feelings". That being said, there are very serious errors in this book that led me to take it with a grain of salt. The first is Meyers' claims about Mithraism on p. 26 of this edition. In fact the first full paragraph on that page is so full of errors that it made me want to stop reading. Simply put, there is no evidence to support all the Christian-like titles ascribed to Mithras. Furthermore, Eastern Orthodox Christmas does NOT occur on January 6. It's on December 25th but of the Julian Calendar, which for us Gregorian-calendar users is January 7 (not 6!). In Chapter 3, Meyers suggests that the Gospel of Mark is responsible for later doctrines that Jesus' death was a substitutionary atonement for our sins, thereby ignoring the words of Paul in Romans 3:25, 5:9, writing decades before Mark. I have to remind myself of Meyers' location. Christianity in Oklahoma is probably not as pluralistic as, say, the more liberal Northeast. But in concentrating on all the things the institutional church has done wrong, he ignores the things the church has done right. For starters, traditional worship has inspired thousands of people across generations to compose beautiful poetry and sacred music. True, what good is music when people are starving? But creativity and exploration are valid parts of the human experience too. At the beginning of Chapter 7, he criticizes what he calls the church's modern "dating game" with people. People shop around for a church, find one, and if they're both compatible, they continue seeing each other. If not, then they part ways, free to visit another church. No, Meyers says. Attending a church should not be a rough ride, to use the airplane metaphor Meyers employs, and attendees should be warned not to expect "smooth air". Quoting Annie Dillard, Meyers agrees that "ushers should... lash us to our pews." Meyers forgets that all of these things have happened. History is filled with the cruel sins of the institutional church, pressuring the faithful to attend Mass, forcing them to obey its doctrines, excommunicating and/or executing those who disagreed. I'd rather have the "dating game" than return to that. It's funny. If you turned this book into a questionnaire, I'd probably agree with 90-95% of the positions therein. And I've been known to express some of the same sentiments probably even more forcefully and bitingly than Myers does. So why can I only give it two stars? Well, I think Rev. Myers has a case of blogger's disease. I don't even know if he blogs, but he sure sounds like a professional blogger or (maybe worse) a professional Internet commenter - always ready for debate and always on th It's funny. If you turned this book into a questionnaire, I'd probably agree with 90-95% of the positions therein. And I've been known to express some of the same sentiments probably even more forcefully and bitingly than Myers does. So why can I only give it two stars? Well, I think Rev. Myers has a case of blogger's disease. I don't even know if he blogs, but he sure sounds like a professional blogger or (maybe worse) a professional Internet commenter - always ready for debate and always on the attack. Myers obviously dislikes Christian fundamentalism, which is fine, but he doesn't seem to realize that he comes off as a fundamentalist himself - just of another kind. He's still playing on the same field and by the same rules as his opponents, and in places starts to become a mirror image of them. It's largely a book of apologetics, which can be entertaining in small doses, but hard to take in large amounts. The structures, attitudes (win at all costs, snark and ridicule, etc) and techniques are the same, whether it's Catholic, Calvinist, New Atheist, or "progressive" Christian - only the content differs. Maybe it's just me - I have a certain limit for a lot of Internet discourse. And it's been a while since I largely lost my faith in argumentation and debate (there's such a thing as winning an argument logically and rationally but still coming off as a jerk, which I eventually decided just wasn't worth it). But imagine a 231-page viral Facebook post during election season, and you're getting close to how this book reads. There are pages after pages where every third sentence is a quip or an attempt at a cutting witticism, the kind that fits nicely on Twitter. For example, in his chapter on Jesus' resurrection, he continually (and I mean *continually*) uses the phrase "resuscitated (sp?) corpse". Over and over and over and over and over. By the 15th or 20th use of the phrase, it becomes clear that he's driving home a point hard. I get it - I don't agree with it, but I get it. What I wonder is how his parishioners who might believe in a bodily resurrection feel. It's not just that Myers doesn't like it - it's that he takes a metaphorical flamethrower to the idea, dancing on its ashes and (to steal a phrase from John Powers) being a "sore winner", rubbing it in people's faces, implying in several places that they're somehow morally or psychologically deficient for believing what he doesn't. This is certainly one of those books you have to read with an open mind... dissecting the facts, considering the reasoning, and accepting his or forming your own opinions. As a highly educated minister, Meyers digs deep - cracking the bedrock of many assumptions about basic Christian beliefs. If you read this with a grumpy face, you'll miss a lot. As a philosopher, he questions many important things. Is "faith" the same as "belief"? And what are the differences and the redemptive qualities of eac This is certainly one of those books you have to read with an open mind... dissecting the facts, considering the reasoning, and accepting his or forming your own opinions. As a highly educated minister, Meyers digs deep - cracking the bedrock of many assumptions about basic Christian beliefs. If you read this with a grumpy face, you'll miss a lot. As a philosopher, he questions many important things. Is "faith" the same as "belief"? And what are the differences and the redemptive qualities of each? Are we transformed by judging the world or by physically changing it for the better? Does our salvation come from accepting certain statements as fact, or by living out our faith through correcting the injustices of hunger, poverty, and illness? Even on topics where I didn't agree with his reasoning or conclusions, he caused me to think nonetheless - something vitally important. For instance: what is more of a miracle - that Jesus was born part-God of a virgin Mary, or that he lived a 100% human life so true to God that he BECAME the son of God? We would expect that even a half-God could perform miracles and live perfectly, but is that really a miracle? Is that a "Jesus" we can truly follow and strive to be like? Obviously, Meyers doesn't just ask a bunch of questions - he brings Biblical scholarship to the table that allows us to respect and be even more thankful for such a Holy Book. And he strips away a lot of the folklore we've placed on the Bible during the years after it was written. This book was SO FREAKING GOOD I finally learned how to highlight with my Kindle in order to save passages. And I saved a LOT of passages! Problem is, it's a library book so I need to either buy it or re-borrow it every time I want to look at my highlights. Normally I would write them all down in my reading notebook but there are just too many awesome things highlighted in this book to be transposed. Where I am coming from: I am not religious, am not a Christian, but love religion and love the g This book was SO FREAKING GOOD I finally learned how to highlight with my Kindle in order to save passages. And I saved a LOT of passages! Problem is, it's a library book so I need to either buy it or re-borrow it every time I want to look at my highlights. Normally I would write them all down in my reading notebook but there are just too many awesome things highlighted in this book to be transposed. Where I am coming from: I am not religious, am not a Christian, but love religion and love the good things that religion can do. I struggle mightily with the Christian community surrounding me. Seems more like a bunch of white people going to a fancy country club every Sunday that excludes people on the margins. It's entitlement, not enlightenment, as the book put it. I have always had an aversion to creeds and the "I believe" obsession of many churches. I especially have a problem with the blood atonement doctrine. Meyers offers an interesting alternative to this mind set that has me rethinking my faith. Definitely drags you out of your comfort zone and makes you THINK. Something we all need from time to time. I can’t recommend this book to anyone due to its weak content and a religious book that is written out of context. The theology basis of this book fails to emulate the teachings in the Bible and is in fact in contrary to it, which is very dangerous false teaching lurking around in the church. This has got to be the most disappointing book I’ve ever read and couldn’t get past the first two chapters. As a lifelong UCC/Congregationalist, the author is preaching to the choir here. This is not a book that will change the beliefs of fundamentalist Christians, but does provide "moral support" and perhaps some talking points for those of us who have often felt dismayed at being marginalized as "not TRUE Christians" for our emphasis on social justice rather than personal salvation. This is not a "new" Christianity, but a restoration of the original "intent" of Jesus, as far as I am concerned. It is As a lifelong UCC/Congregationalist, the author is preaching to the choir here. This is not a book that will change the beliefs of fundamentalist Christians, but does provide "moral support" and perhaps some talking points for those of us who have often felt dismayed at being marginalized as "not TRUE Christians" for our emphasis on social justice rather than personal salvation. This is not a "new" Christianity, but a restoration of the original "intent" of Jesus, as far as I am concerned. It is refreshing to read an impassioned defense from someone who shares my point of view. As even the title shows, Meyers is talented at including witty sayings that grab one's attention. Yet, when one looks beyond these, there still is substance to Meyers position. The biggest criticism I would hold for the book is that Meyers has a distorted perspective of where most Biblical scholars stands. He often writes as if more progressive Biblical scholarship has won out as the dominant view among scholars, even is not the dominant position held by most pastors and lay people. While the Bi As even the title shows, Meyers is talented at including witty sayings that grab one's attention. Yet, when one looks beyond these, there still is substance to Meyers position. The biggest criticism I would hold for the book is that Meyers has a distorted perspective of where most Biblical scholars stands. He often writes as if more progressive Biblical scholarship has won out as the dominant view among scholars, even is not the dominant position held by most pastors and lay people. While the Biblical scholarship world is arguably more progressive than most ministers or lay people, the dominant position seems to be more moderate with a larger number of conservative scholars than what Meyers acknowledges. A primary emphasis of the book was Meyers argument that individualism has greatly changed and distorted the Christian message, which I would argue is quite evident. However, Meyers then takes this and addresses many very practical issues. I am still struggling with the possibility of letting go of my belief in Jesus' virgin birth and bodily resurrection, but I can see where the Church has used His "Christ-ness" to overshadow what He said as a Rabbi. It's much easier to "be washed in the blood" than to take up your cross and follow Yeshua. It's easier to be a Christian Soldier, worshipping an "Awesome God" than to do what He says, giving up material things and showing true compassion for our neighbors (which include undocumented al I am still struggling with the possibility of letting go of my belief in Jesus' virgin birth and bodily resurrection, but I can see where the Church has used His "Christ-ness" to overshadow what He said as a Rabbi. It's much easier to "be washed in the blood" than to take up your cross and follow Yeshua. It's easier to be a Christian Soldier, worshipping an "Awesome God" than to do what He says, giving up material things and showing true compassion for our neighbors (which include undocumented aliens, Muslims, prisoners, etc). It's easier for a church to sell the social and exclusivity (we're in - they're not) aspects of membership than to have its adherents throw all their possessions into the commons for all to use (that sounds like communism to me!). This book was hard to read in that it was very challenging and made me think - a lot. And I ultimately did not agree with everything Meyers had to say. So why the 5 stars? Because this book was hard to read in that it was very challenging and made me think - a lot. And I ultimately did not agree with everything Meyers had to say. The concept of a difference between worshiping Christ and following Jesus is one with which I have been at least somewhat familiar for over 25 years. And pretty much agr This book was hard to read in that it was very challenging and made me think - a lot. And I ultimately did not agree with everything Meyers had to say. So why the 5 stars? Because this book was hard to read in that it was very challenging and made me think - a lot. And I ultimately did not agree with everything Meyers had to say. The concept of a difference between worshiping Christ and following Jesus is one with which I have been at least somewhat familiar for over 25 years. And pretty much agreed with. I do even more now 25+ years later. And particularly after reading Meyers' book. I still don't buy everything Meyers says - he sets things up too "either-or" for me; he creates more dichotomy than I like or am comfortable with. Having met Robin Meyers and heard him speak, I was very disappointed in this book. While I found parts of it apt and even important, the overwhelming impression I was left with was of another classic liberal theologian pontificating with classic liberal arrogance on the basis of timeworn "revolutionary new theology" that only seminary students find interesting any more. I am assured by friends that his second book, The Underground Church, is far more like the Rev. Dr. Meyers I met and heard -- wi Having met Robin Meyers and heard him speak, I was very disappointed in this book. While I found parts of it apt and even important, the overwhelming impression I was left with was of another classic liberal theologian pontificating with classic liberal arrogance on the basis of timeworn "revolutionary new theology" that only seminary students find interesting any more. This book is definite not an orthodox take on Christianity. The author calls the virgin birth and other staples of Christian teaching into question. At the same time, the book is a powerful argument for following the teachings of Jesus (no Christ). It removes the veil of church traditions, the focus on Christ, and the teachings of organized religions. It instead brings the teachings of Jesus to the fore and reminds us of the two most important commandments: Love the Lord God and love your neighbo This book is definite not an orthodox take on Christianity. The author calls the virgin birth and other staples of Christian teaching into question. At the same time, the book is a powerful argument for following the teachings of Jesus (no Christ). It removes the veil of church traditions, the focus on Christ, and the teachings of organized religions. It instead brings the teachings of Jesus to the fore and reminds us of the two most important commandments: Love the Lord God and love your neighbor as yourself. Those teachings are truly radical, and if we all followed them, we could change the world. Very insightful. The Church has, for the most part, forgotten about the critical importance of the teachings of Jesus. It prefers to focus on doctrines and theologies, rather than focusing the practical application of Jesus' directives and teachings. Robin illustrates for us how we can get back to the essentials of walking in the path Jesus guided us to, that path that too often the Church has lead us away from. The first time I came across Robin Meyers I was watching his Beecher Lectures from 2013 on YouTube (here is the first of the 3 part series - https://www.youtube.com/watch?v=H8gkZ...). He is compelling and challenging. His modus operandi is to be defiant in order to allow us to be more like Jesus. So, when I picked up this book suggested by a coworker I was not surprised by the defiant and unorthodox views found in the book, but they still are powerful and compelling nonetheless. With a title lik The first time I came across Robin Meyers I was watching his Beecher Lectures from 2013 on YouTube (here is the first of the 3 part series - https://www.youtube.com/watch?v=H8gkZ...). He is compelling and challenging. His modus operandi is to be defiant in order to allow us to be more like Jesus. So, when I picked up this book suggested by a coworker I was not surprised by the defiant and unorthodox views found in the book, but they still are powerful and compelling nonetheless. 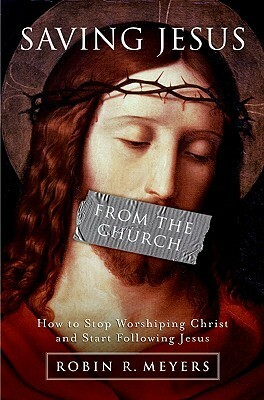 With a title like "Saving Jesus from the Church: How to Stop Worshiping Christ and Start Following Jesus" you know you are in for a ride. The core idea that Meyers is promoting is found in the title. He is preaching for us to put aside a version of the gospel that tells us to just believe in the Christ that came and died for us, and instead become disciples of the life of Jesus. He states, "Jesus did not come to die, rendering his life and teaching secondary. He died because of his life and teachings. He was killed for the things that he said and did. Then the claim of his first followers and his first community is that God raised him from the dead to undo the injustice done to him and to place a divine stamp of approval on his words and deeds.... Placing all the emphasis on the saving effect of the death of Christ as a cosmic bargain negates the life of Jesus." Meyers makes it clear that Jesus's ministry on the earth had very little to do with right belief and everything to do with right living and right being in this life. In regards to this he says "Consider this: there is not a single word in that sermon about what to believe, only words about what to do. It is a behavioral manifesto, not a propositional one. Yet three centuries later, when the Nicene Creed became the official oath of Christendom, there was not a single word in it about what to do, only words about what to believe!" With regards to the demands of the two types of Christianity he explains,"Christianity as a belief system requires nothing but acquiescence. Christianity as a way of life, as a path to follow, requires a second birth, the conquest of ego, and new eyes with which to see the world." * Jesus’s concern was to teach how to be in this world and now Christianity only seems to care about what you believe. * True religion is relationship, not righteousness. * Religion and politics do mix because your religion should change the way you relate to others in the world. * Prosperity gospel is bogus and has no foundation in Christianity. * This is the last series of questions posed and the summary of the book: "What if we could pull off a modern-day miracle and persuade a whole community of human beings that faith is characterized by what I have called from the pulpit “the end of striving”? What if we could shift the idea of salvation from survival of personal identity to radical freedom? Not freedom from—obligations, promises, fidelity, commitment, and self-sacrifice—but freedom to—live beyond angst, be delivered from self-pity, escape the prison of self, grow old gracefully, master the ego, live in harmony with the natural world, and break the chains of fear itself, especially the fear of death? What if we followed Jesus, instead of just worshiping Christ?" The book is written by a United Church of Christ minister. The basic theme is that churches do not really understand just what it is that Jesus said and preached. He examines the historical Jesus, the crucifixion, , the Gnostic vs. the 'accepted' gospels, the argument in the gospels themselves about who first saw the resurrected Jesus, wisdom theology and a variety of other related topics. The basic idea is that Christian religion has interpreted the teachings of Jesus in a rather negative way a The book is written by a United Church of Christ minister. The basic theme is that churches do not really understand just what it is that Jesus said and preached. He examines the historical Jesus, the crucifixion, , the Gnostic vs. the 'accepted' gospels, the argument in the gospels themselves about who first saw the resurrected Jesus, wisdom theology and a variety of other related topics. The basic idea is that Christian religion has interpreted the teachings of Jesus in a rather negative way and that the emphasis should be on following Jesus and his sayings as a person and not as a being to be worshiped. Dr. Robin Meyers is an ordained minister in the United Church of Christ (UCC), a tenured professor in the philosophy department at Oklahoma City University, an author, a syndicated columnist, and an award-winning commentator for National Public Radio. He has been the Senior Minister of Mayflower Congregational UCC church of Oklahoma City, the fastest-growing UCC church in the Kansas-Oklahoma confe Dr. Robin Meyers is an ordained minister in the United Church of Christ (UCC), a tenured professor in the philosophy department at Oklahoma City University, an author, a syndicated columnist, and an award-winning commentator for National Public Radio. He has been the Senior Minister of Mayflower Congregational UCC church of Oklahoma City, the fastest-growing UCC church in the Kansas-Oklahoma conference, since 1985. Dr. Meyers was born in Oklahoma City, and grew up in Wichita, Kansas. After graduating from Wichita State University (1975), he received his MDiv from the Graduate Seminary of Phillips University (1979) and his Doctor of Ministry degree from Drew University in Madison, New Jersey (1981). In 1991 he was awarded a PhD by the University of Oklahoma’s Communication Department, for his work in the area of persuasion and preaching. Dr. Meyers is the author of five books. His first, With Ears to Hear: Preaching as Self-Persuasion (Pilgrim Press, 1993), is a textbook for preachers, and his second is a book on living a simpler and more sacramental existence, entitled Morning Sun on a White Piano: Simple Pleasures and the Sacramental Life (Doubleday, New York, 1998), which was endorsed by Bill Moyers. A third book, The Virtue in the Vice: Finding Seven Lively Virtues in the Seven Deadly Sins came out in August 2004 from H.C.I., endorsed by Desmond Tutu. A fourth book, Why the Christian Right Is Wrong: A Minister’s Manifesto for Taking Back Your Faith, Your Flag, and Your Future (Jossey/Bass, San Francisco, 2006), expanded upon an antiwar speech he delivered at the University of Oklahoma that became an internet phenomenon, endorsed by Bill Moyers, Desmond Tutu, John Shelby Spong, and the late William Sloane Coffin Jr.
His fifth book, due out February 24, 2009, from Harper Collins, is entitled Saving Jesus from the Church: How to Stop Worshipping Christ and Start Following Jesus (Harper One, 2009), endorsed by Desmond Tutu, Bill Moyers, Bishop John Shelby Spong, Dr. Fred B. Craddock, and Diana Butler Bass. Dr. Meyers is a member of the Jesus Seminar, and a frequent preacher and speaker at church conferences and communication workshops across the country. He was twice a finalist for the pulpit of The Riverside Church, the Earl Preacher at the Earl Lectures in Berkeley in 2000, winner of the Angie Debo Civil Libertarian of the Year Award from the ACLU, and was featured in an HBO documentary, The Execution of Wanda Jean, the story of the first woman executed in Oklahoma and of Dr. Meyers’s efforts to save her life. His Sunday morning sermon broadcast (KOKC AM 1520, 9:30 a.m.) reaches the largest listening audience of any religious broadcast in Oklahoma. He is married to Shawn Meyers, an Oklahoma City artist, and they are the parents of three children, Blue, 31, Chelsea, 28, and Cass, 15.